If you’re all caught up on my latest Weekly Round-Up, you’ll know that I’ve been trying to eat a bit healthier for the past week or so. Instead of going straight into dieting, I’m hoping to make a permanent change to my lifestyle instead (and lose a few pounds along the way!) 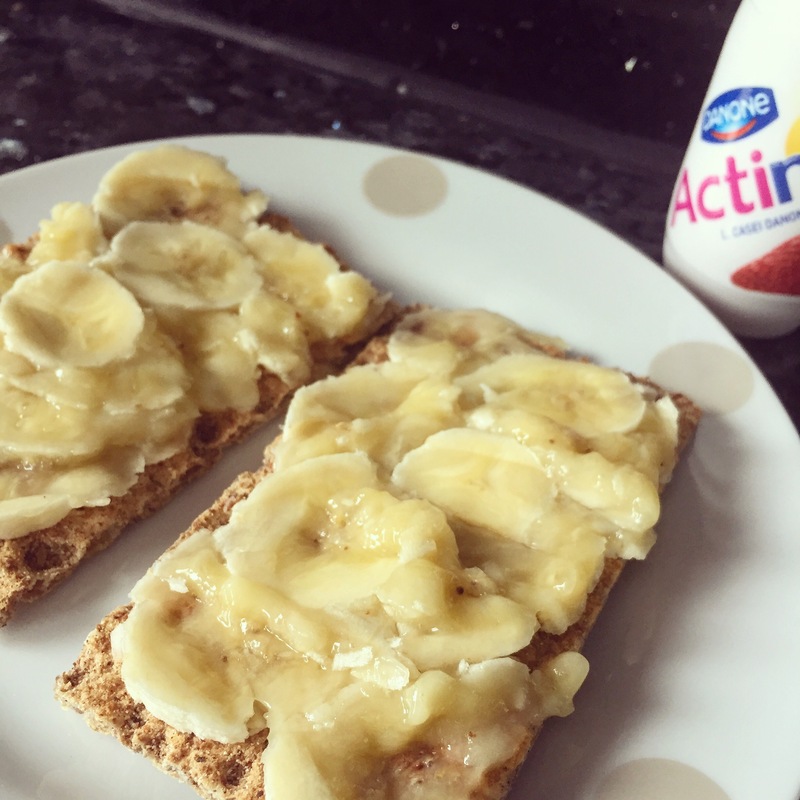 So, although this week’s What I Ate Wednesday certainly isn’t perfect I’m definitely getting there – slowly but surely! 8:30am: Every morning for the past week I’ve been getting up at about 7:15/7:30 to do a morning workout. So, post-workout I thought I’d have something tasty but also full of goodness to keep my energy levels up for the rest of the morning. Today, I opted for 1 banana squashed onto 2 Ryvitas. Yum. 10:30am: Since my life is completely focused on revision at the moment, I need something to keep me going, so a low calorie hot chocolate with a few pieces of dark chocolate is the perfect mid-morning fix. Plus, it’s not as unhealthy as you might think! 12:30am: I don’t usually have a lot of protein in my diet, so recently I’ve been trying my best to eat much healthier and have a more balanced diet. 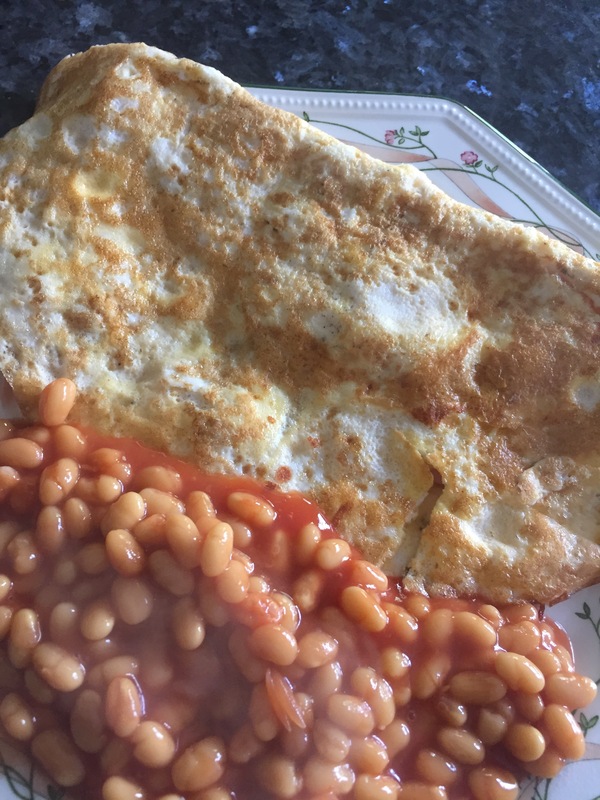 So, for lunch I had a ham and cheese omelette with some beans. I feel like all I’m ever eating is eggs at the moment, for protein – I’ll be turning into one soon! 5pm: My lunch was incredibly filling – in fact, I couldn’t finish it all off – so I was full up until tea time. Then, I had a chicken kiev with some peas. Again, not the healthiest option, but much healthier than I would typically have, and delicious. I did forget to take a photo though…sorry! 6:30pm: Then, things went a bit wrong (as usual!) I’d been having a really down day, and comfort food is my go-to on days like this. So, instead of sticking to my diet, I decided to have some Ben and Jerry’s ice cream. Although this did leave me feeling a bit guilty, I made sure not to have too many spoonfuls, and I resisted any further temptation for the rest of the evening. So, it’s definitely going to be a difficult couple of weeks trying to eat healthy during exam period (when all I want to do is shove hundreds of chocolates down my throat) but I’m trying! Do you have any tips for avoiding comfort food when you’re feeling a bit down? Don’t forget to follow, with a new post every day at 6pm during the week, and 1pm on the weekend!